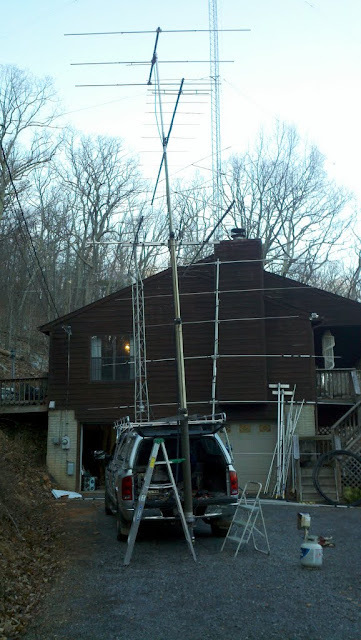 This year Terry W8ZN made big plans to rove in the ARRL Jan VHF SS. 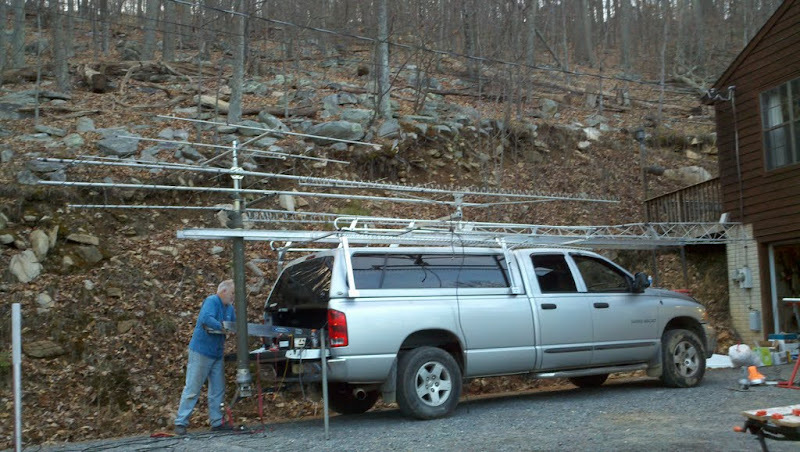 His idea was to outfit his Dodge RAM truck with equipment and antennas to cover 50 MHz through 10 GHz. Terry asked if I wished to join him this year and I immediately agreed. I assisted Terry on the weekends leading up to the contest, but it was Terry who spent many a weeknight handling all the details of trying to pull the big plan together. The weekends leading up to the contest were mild with temperatures in the mid-50s. We were able to get quite a bit accomplished outdoors. The first item at hand was fabricating antenna supports. Click on any image below to zoom in. First up was the microwave support. 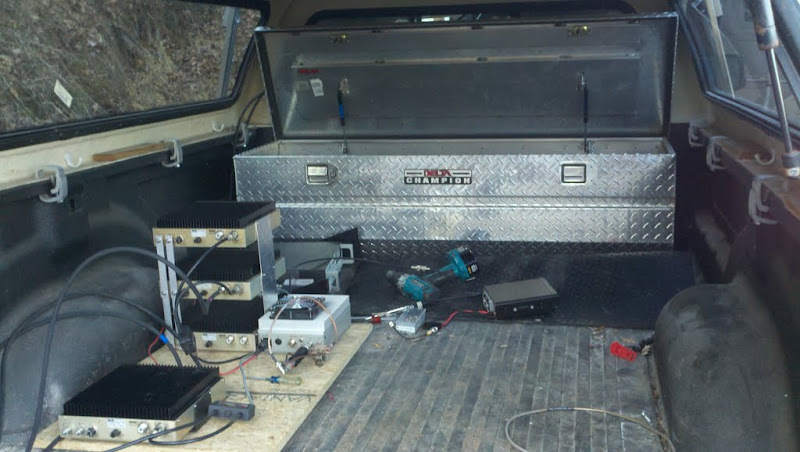 Terry’s plan was to use square, steel tubing and aluminum I-beams to form a brace for a folder over aluminum tower on the front of the vehicle. 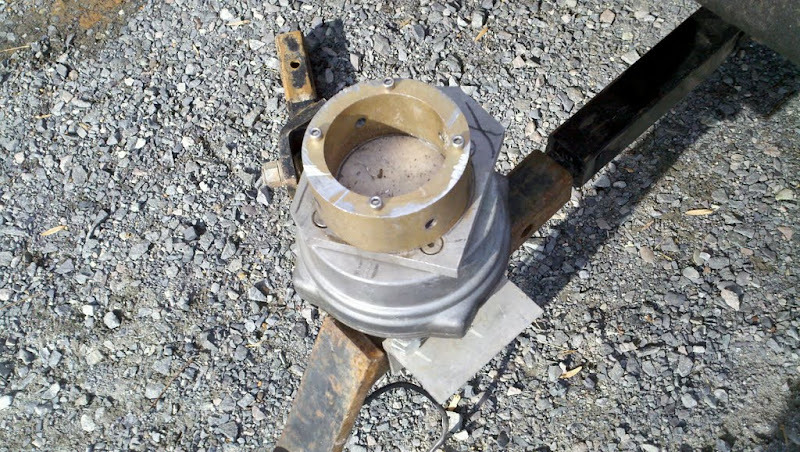 Terry had two square hole post mounts welded under the front bumper that would hold the rectangular, steel frame. 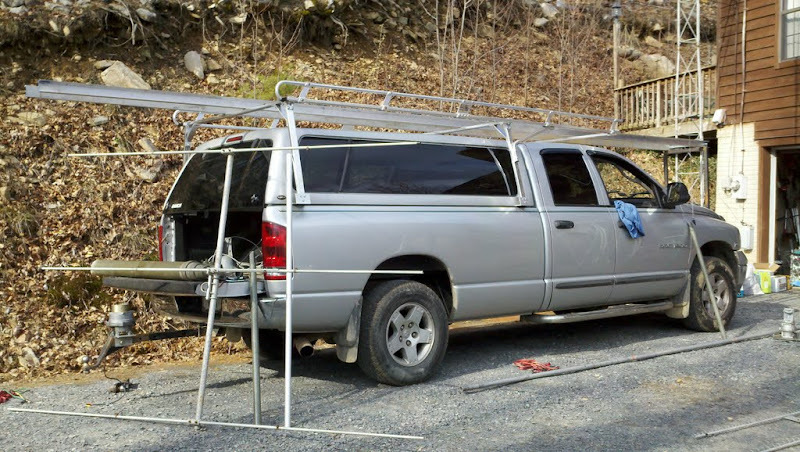 Then he would use two aluminum I-beams connected to the roof racks to hold the frame vertical. 20′ of aluminum remnants of old K8GP bus tower would connect to the steel frame and hinge at about 7′ up. The tower would folder over on to the roof while we traveled and be pulled up once we got on site. 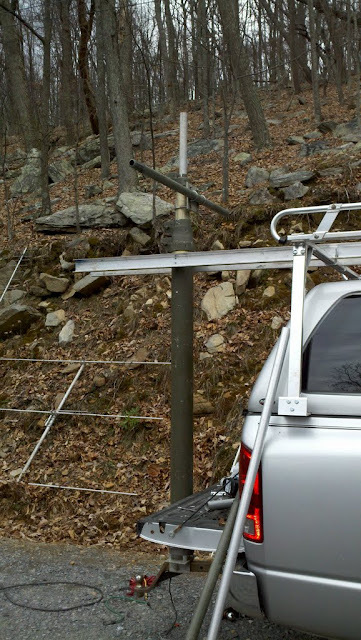 This support would hold rotatable antennas for the 903 MHz through 10 GHz bands. 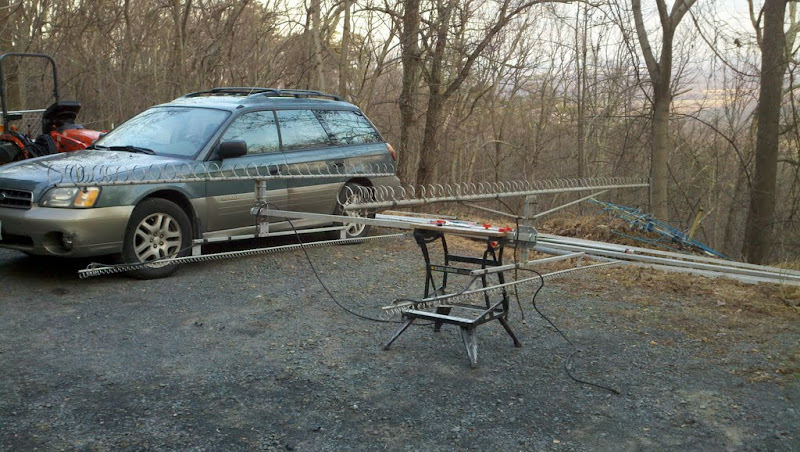 The microwave antennas would consist of and H-frame of long-boom loopers for 903, 1296, 2304 and 3456 MHz. 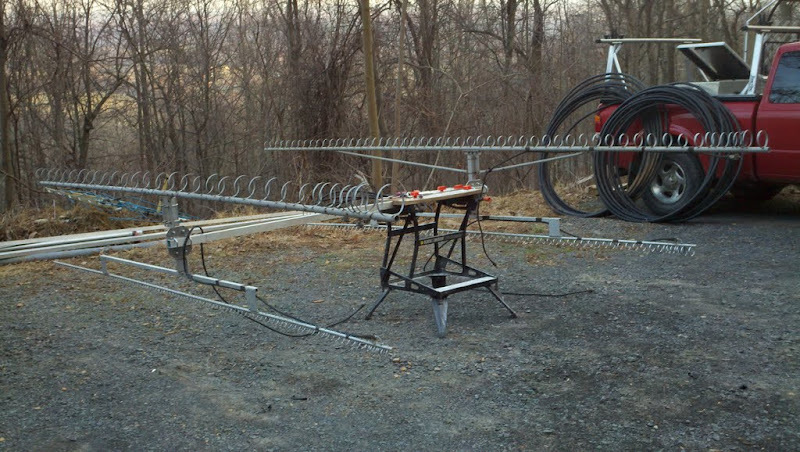 A dual-band 5 & 10 GHz dish would sit in the center of the H-frame array and round out the upper bands. We had to put some thought into this array as we didn’t desire to have to climb the tower and/or install or remove the array once on site. The plan was to build a hinged mount similar to one used by Matt KC3WD Rover. 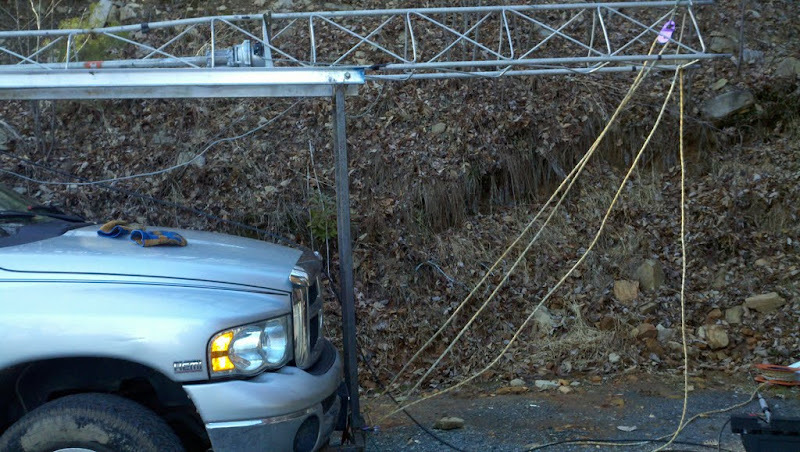 As the tower was lowered the array would swivel and lay flat along the the roof rack with antennas lying about a foot off each side of the vehicle. As the tower was raised gravity would allow the array to swivel and point at the horizon when in use on site. There was surely some trial and error involved in this arrangement, but we finally got it to a point where we were happy and it was stable. 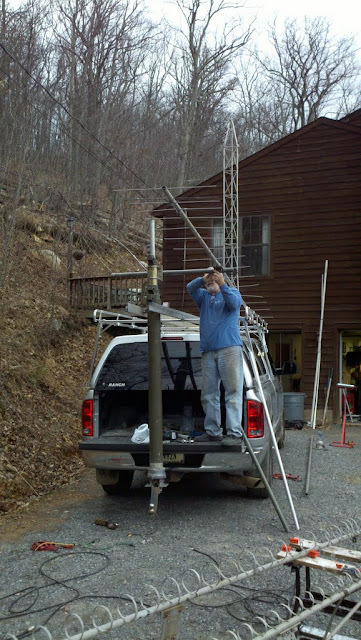 The next task was the rear antenna support for 50 through 432 MHz. Here we would borrow an idea from John W1RT Rover. 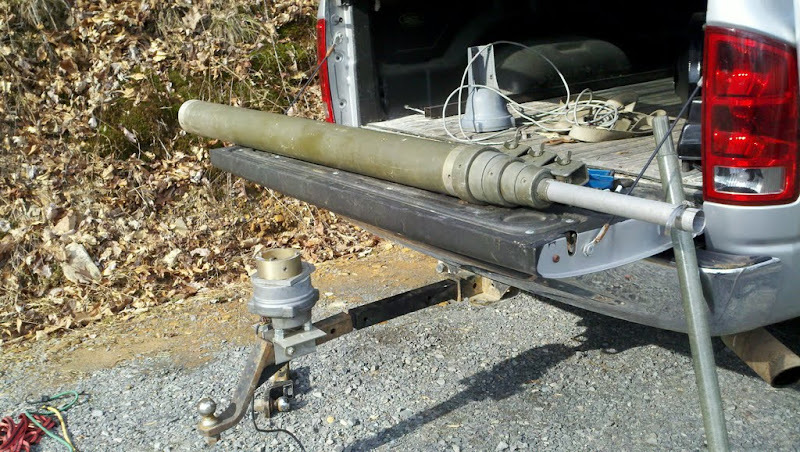 The support would consist of a military, 30′ aluminum crank up mast. 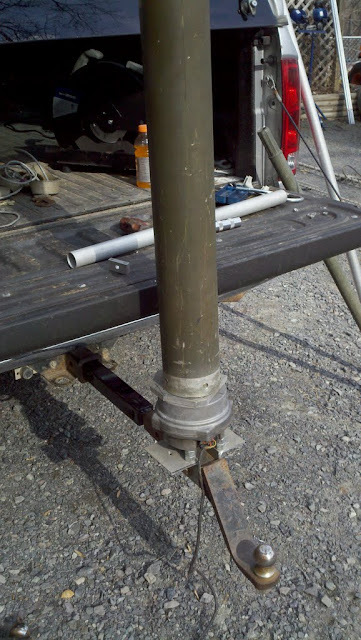 The base of the mast would be mounted on a rotator atop a steel pipe attached to the trailer hitch. The top of the mast would slide through a guide ring attached to the rear of the I-beams that were used to hold the front tower to the roof racks. Terry converted the rotator to 12v DC, such that we could run off batteries and eliminate any need for switching inverters, which generate a fair amount of RF hash. 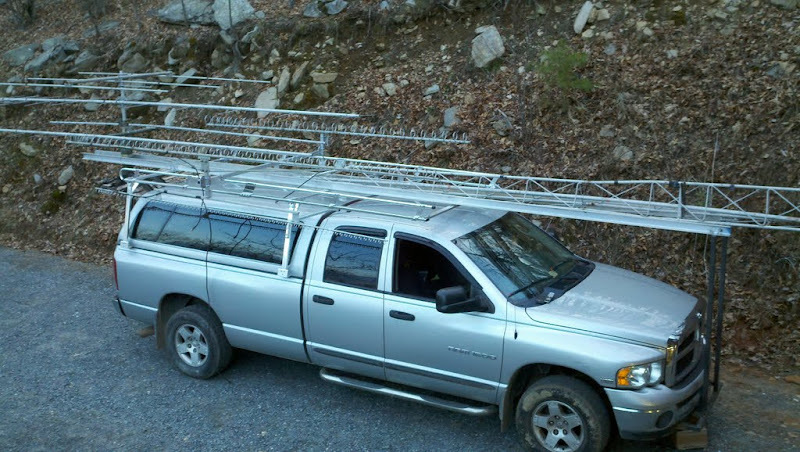 The low 4-band antennas would consist of a short 3 element 50 MHz beam and long boom yagis for 144, 222 and 432 MHz. 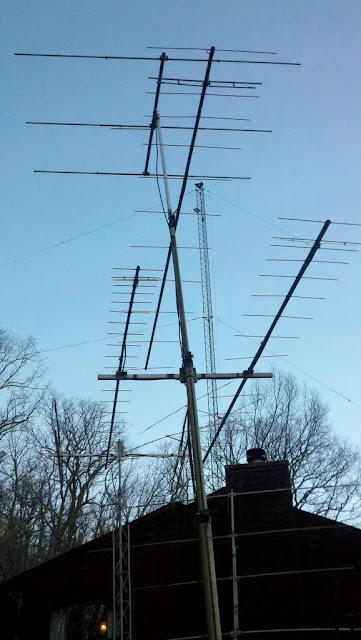 The antennas were staggered on the collapsible mast such that when the array was cranked up there would be appropriate spacing between the antennas. The only hitch was we had to pin and rotate the 6m beam 90 degrees before and after operating. 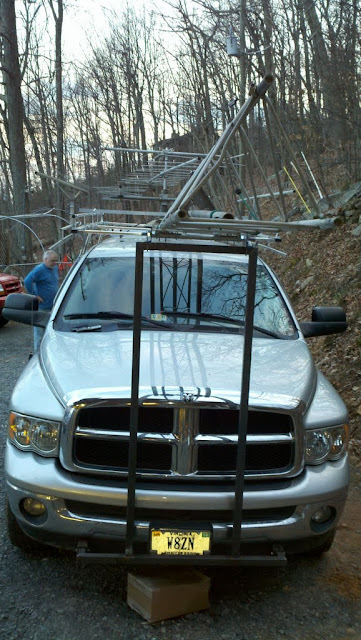 Terry acquired a new role of coax which we ended up using all of it for the 4 runs of ~45′ each up the mast. Once a majority of the outside work was done it was time to concentrate on the radios. Initially the low 4 bands would consist of an FT-100 for 50, 144 and 432 MHz driving respective 200-400 watt TE amplifiers. For 222 MHz we’d use the 10m i/f on the FT-100 to drive a DEMI transverter and another TE amp. The low band station came together pretty easily. 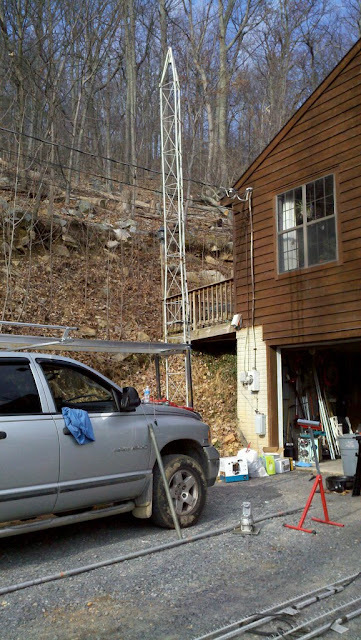 Once we wired up the antennas we fired up the receiver and were able to tune in several of the VHF beacons. The rotator seemed to handle turning the mast OK, though a bit slowly, given Terry’s lack of choice for gears when re-gearing the motor. Unfortunately the FT-100 starting acting flaky on 432 MHz, so by contest start we’d have to find another radio. Next up was installing and wiring up the main power, three 12v heavy duty batteries, the charging lines, to include a new higher power alternator. 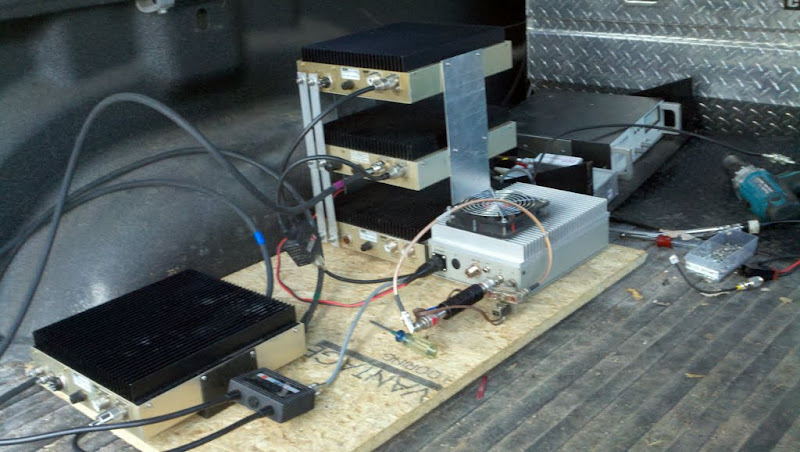 With all the power consumption planned for the rove Terry thought it wise to boost the stock 12v system in the truck. All the DC would sit in the silver tool chest that sat in the back of the truck bed. After the DC was rigged up it was on to the low band amps and microwave transverters. A piece of plywood would suffice to hold the 50-432 MHz amp stacks and some miscellaneous switch circuits. 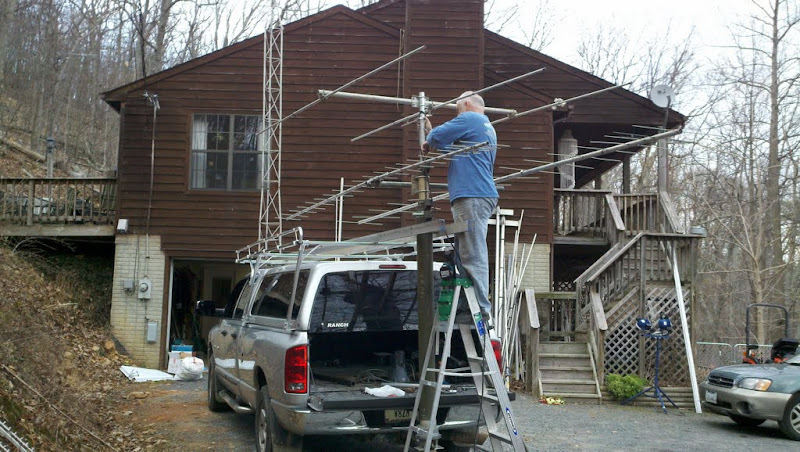 As the contest weekend grew closer Terry was still working on the microwave equipment and finding a loaner replacement for the FT-100. 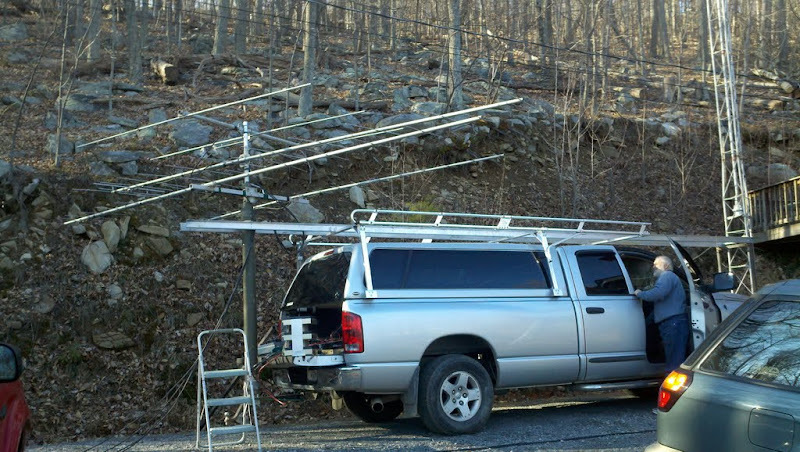 Loaner options dried up and Terry broke down and got a new IC-7000 and wired it into the truck. As I was to be the low band operator this was a pleasant surprise. The radio is quite easy to operate and offers a number of nice features for contesting to include built-in keyer for cw & voice. At home, my job was to prepare the logging computers (Dell D400), network, GPS and Win-keys for use in the multi-op rover. I’d acquired the latest RoverLog and loaded all the appropriate software and drivers. The entire system worked flawlessly in the house. GPS was reporting 6 digit grid. The computers were logging and passing info over the network. CW keyers were programmed and ready to go. The night before the contest Terry reports a big problem with the microwave gear. As it turns out the equipment was last used for the K8GP multi-multi station where all the transverter local oscillators had been converted over to use a GPS 10 MHz reference source, which required 48v DC. It was too much work to covert the equipment back to internal LO’s and acquiring and running off a 48v DC switching power supply was not an option due to bad RF hash. On contest eve it was decided that our only option would be to run as a limited 4 band rover. That wouldn’t be our only problem though since as we’d worried the weekend weather was turning out to be nothing like it was during our previous rover preparation weekends. As Saturday dawned it was evident that we were in for some messy weather. Roads were icy and snow was reported in the mountains. Terry and I decided to wait later in the day to make a call on what to do. Finally it was decided we’d go out for a brief day rove with the limited rover. Terry picked me up around 2pm and we proceed to head to Skyline Dr. vs Reddish Knob, our originally planned starting point in FM08. Our fear was we didn’t want to go too far and find the roads closed. Since we were down to one operating position I only needed one laptop. Unfortunately this isn’t the configuration I tested on the bench. So, as I listened to 6m Eskip while I madly tried to determine why the logging software kept locking up I failed to cash in on any of the DX. After about 30-45 minutes down the road and reworking the RL configuration all was well, of course 6m was now closed, so I proceeded to scan the bands to work those I could while we headed to Skyline. We make our way down Rt. 66 to Front Royal and to the Skyline Dr. entrance, but sure enough, its closed. I’m only able to hand out a limited number of FM08 contacts and we work 8 QSOs & 3 unique grids from the flat lands and we turn around and head north. Back to Rt. 66 west, then 81 north to FM09, a spot recommended by our fellow rover friend Brian ND3F. Road conditions are worse as we head up the mountain road. 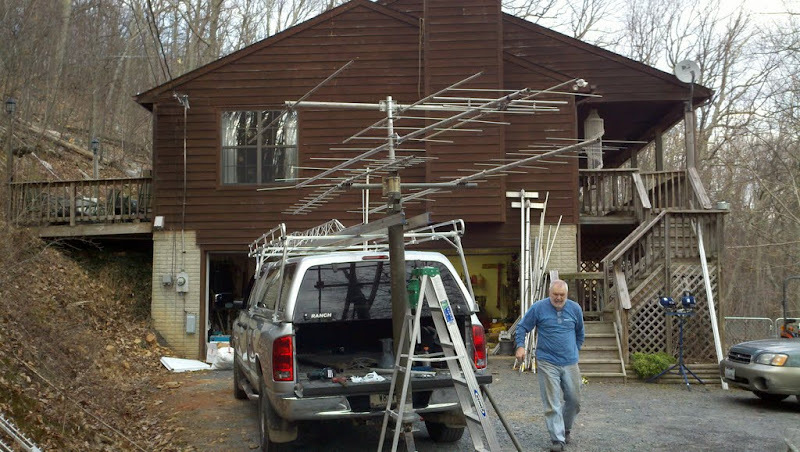 We run across K1RZ on 6m. He reports bad ice at his place with high SWR on all his antennas. 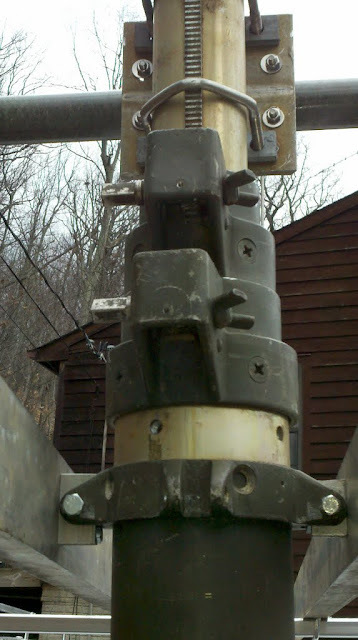 He is unable to move his rotator and it is stuck in an unfavorable position. We finally make it up to a small field at our FM09 spot. It was quite misty and overcast at this location, so there wasn’t too much to see. Terry and I and crank up the mast in the dark by the light of the flashlight and finally get on the air. I operated the entire 1.5 hours from FM09 while Terry caught up on some much needed shut eye. We were on site from 2300-0030z. I made 92 contacts with 13 unique grids. My best DX on the various bands included VE1AI in FN85 50 MHz, K1TEO in FN31 on 144 & 222 MHz and K4QI in FM06 on 432 MHz. We had terrible line noise to the west and south west, so I was unable to work much in those directions. Conditions were flat as was to be expected, but the fact that I was able to average contacting one station per minute wasn’t bad. So, it was time to wake up Terry, crank down the mast and head back down the hill and up to our next operating position in FN00. It was approximately another 1.5 hours down the road and a food stop before we were able to get on the air from our next grid. 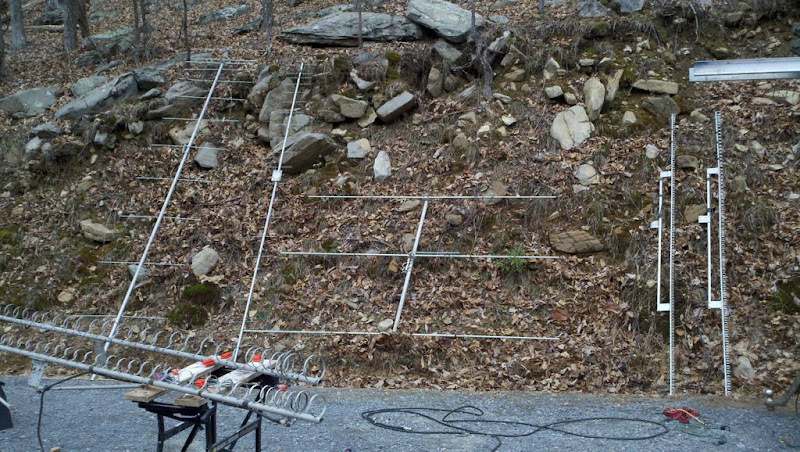 This locations was a microwave tower site near Breezewood, PA that we were turned onto many years ago by fellow Grid Pirate Ken N4UK. The access road to the site had a few inches of snow on it, but the heavy 4WD truck didn’t have any problems with that. This location was the site I first operated with the Grid Pirates as a group back in ARRL Sept. 1994 VHF contest under the call W3ZZ. You can see what this place roughly looks like in the daytime by checking out some old pictures here as well as a MUCH younger looking group of GP ops. Out into the snow to crank up the mast and then get on the air. We would operate from site for 2 hours from 0300-0500z. I let Terry operate the first 1.5 hours while I attempted to take some night time pictures of the rover out in the snow. Weather conditions were much different here. The sky was clear and there were millions of stars to be seen. Below are a few of the best pictures I could find from our time at the site. In the end from this site we ended up making 56 QSOs and 11 unique grids. Activity seemed down compared to the earlier grid, though I expect with the late hour and bad weather moving up through the northeast that this is as good as we could expect. Our best DX on the bands from FN00 were K4XXX in EM97 on 50 MHz, K1KG in FN42 on 144 & 222 MHz and KG4HOT in FM27 on 432 MHz. After that we opted to head home. It was after 2AM before we were able to get some much needed sleep. Terry talked about going out to a few grids on Sunday, but eventually stayed home. It wasn’t as fun operating without the microwave bands and two ops was overkill for a limited rover, so we both just took it easy and relaxed Sunday. Only about 10K pts score in the end. Maybe we’ll have better luck and weather next year. 73 and thanks for the QSO’s. 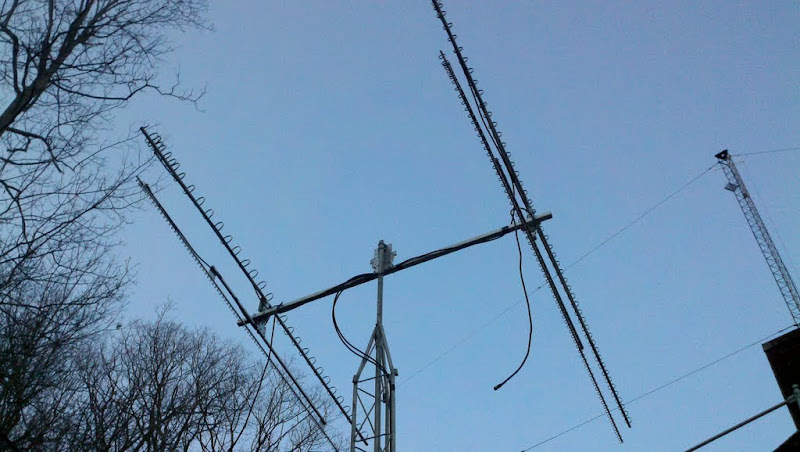 My pleasure on 6 meters! Will look for you next time on 6, 2, and 432! !